TORONTO, ON – Beer import agency Silvercreek Import Partners has announced that it has brought a new style-focused holiday sampler pack from Michigan’s Rochester Mills Beer Company into Ontario. 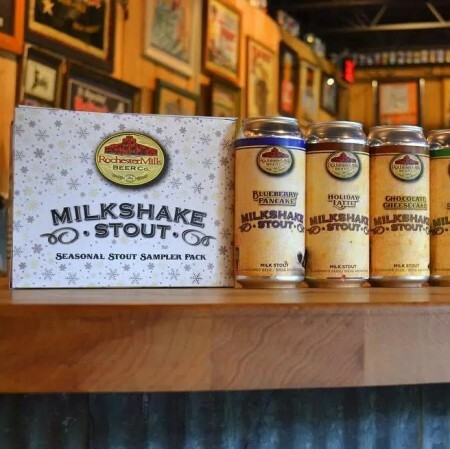 The Milkshake Stout Seasonal Stout Sampler Pack features 473 ml cans of six varieties selected from the brewery’s Twelve Days of Milkshake Stout package which is a popular item in its home state. Blueberry Pancake Milkshake Stout (4.5% abv), Crème de Menthe Milkshake Stout (4.5% abv), Imperial Milkshake Stout (7.5% abv), Chocolate Cheesecake Milkshake Stout (4.5% abv), and Holiday Latte Milkshake Stout (4.5% abv). The Rochester Mills Milkshake Stout six-pack is available now at select LCBO stores in Ontario as part of the chain’s holiday gift promotion. For more details, see the Silvercreek Import Partners website.